Kirstin, an alumnus from 1980, remembers her time at USyd vividly. She speaks of living on main campus for the duration of her Science degree and visiting her family on the weekends when she could. Her friends were “very jealous” of her living arrangement and loved to pop around for meals after class. She describes herself as extremely lucky: “Very few people lived on campus during my time and there were a lot fewer accommodation options.” Yet the scarcity of residential vacancies has not only persisted, but increased—especially as the University’s student numbers have boomed over the last few decades. What was once a minor annoyance – as ‘cheap’ housing could be found in neighbouring suburbs like Forest Lodge or Newtown—has warped into a crisis of necessity, where the University has failed to ensure all their students have a roof over their heads. Despite requiring students to provide their residential details upon enrolling, the University maintains that it doesn’t hold data on students’ living arrangements. Similarly, in the USyd-funded Mind the Gap report, part of a National Disability Insurance Scheme initiative, the University found homeless and ‘transient’ people, especially those with mental illness or disabilities, are “hard to track down”, making outreach programs almost impossible. If we accept this proposition, then by the University’s own logic, its plans to renovate current accommodation or add new buildings and beds are necessarily flying blind, without any data to target supply to demand. There are only 10,493 purpose-built rooms in the vicinity of USyd, despite a student population of over 50,000. Data from the last census, as reported by the Sydney Morning Herald, revealed that nearly 11,000 tertiary education students are homeless, and are forced to couch-surf, sleep on the streets or in cars, or stay in boarding houses, overpopulated rooms or homeless facilities. A similar 2013 ABS study found that 6 per cent of Australian-born students and 20 per cent of those born overseas live in overcrowded housing. Emergency accommodation is available to students who may be experiencing homelessness or other issues such as domestic violence. According to a spokesperson, the University holds only two properties solely for the purpose of emergency accommodation: on Burren Street and Mallet Street. Between them, these properties offer four rooms of temporary shelter. If these properties reach capacity, USyd has relationships with university residences and nearby hotels. The University’s emergency accommodation can be sought through the dedicated Student Accommodation Services, through referral by the Counselling and Psychological Services (CAPS) or through the police. But some students slip under the radar. Another option is STUCCO co-operative in Newtown, which the University and the Department of Housing have a stake in and offers temporary accommodation for both domestic and international students “who are genuinely in need” . This emergency housing doesn’t carry a charge, but students are only able to live in the six rooms on offer for two weeks, unless their application is extended upon review. The limited number of rooms fill fast, as is often the case at the beginning and end of semester. The range of options would suggest a large supply, and that incoming students get to choose housing that works with their budget. That is not the case: according to the report, there are only 10,493 purpose-built rooms in the vicinity of USyd, despite a student population of over 50,000. Combining that with the University’s proximity to other large institutions such as UTS means that, when it comes to dedicated student accommodation facilities, Inner Sydney has a student-to-bed ratio of 8.9:1. Of the University’s housing, only five of the 1000 total rooms are currently available in new or refurbished accommodation, while no beds at all are available in older on-campus accommodation (excluding International House). Recent years have seen a massive growth of private off-campus providers, such as Urbanest and Iglu, charging exorbitant fees for their services. The report notes that there are 921 beds serving USyd that are “owned and operated by major student accommodation providers who have some affiliation with a university”. Despite room sizes, facilities and inclusions comparable to those provided in university-owned properties, these companies charge between 37.5 and 50 per cent more than the latter option, and up to 34% more than their market value (which is estimated at $412.50/week for a one-bedroom apartment, according to the Social and Economic Benefits report). Another option, not included in the report, is STUCCO’s long-term accommodation—which has the cheapest rental rates by far. The co-op, one of three nationwide, ensures that its affordable housing ($92/week), prioritises low-income students, yet the 40 ‘members’ it houses can only be Australian citizens or permanent residents. According to STUCCO’s website, potential candidates are screened based on their personal financial details, their family situation and whether they’ve faced societal discrimination. The high relative costs of the competitive inner-city rental market mean that students are driven to other options. Often illegal operations target international students with less disposable income or knowledge of Australian laws. Last May, at an Academic Board meeting, the Vice-Chancellor noted that the University had been forced to “become more reliant on international student income than it would like to be”. ABS data shows that Australia’s international student population has increased 12 per cent since last year, and is heavily concentrated on Melbourne and Sydney university campuses. If we put these rising numbers together with the dire state of student housing, it’s clear the University is reaping profit from charging international students ever higher fees, but struggling to ensure their guests have a place to live. It is not just the homelessness numbers that are startling. The University of Sydney plans to add another 10,000 students by 2020, and the lack of housing options is forcing students into dangerous or illegal accommodation, or out of housing altogether and into homelessness. According to Universities Australia in 2012, average weekly income is $358 for domestic students and $379 for international students, meaning ‘affordable’ rent would be $152.40 for lower income students, as calculated in the Social and Economic Benefits report. That’s a price point verging on the non-existent, and can be found only in illegal, overcrowded squats. The University’s Campus Improvement Program (CIP) 2014-2020 is USyd’s current major redevelopment project, targeting all aspects of campus life. It’s an amalgam of smaller individual projects, separating USyd into six precincts according to their area of academic study. Honi reported in 2016 that the CIP came with a $1.4 billion price tag, with The Daily Telegraph writing in 2017 that the total cost would be $2.5 billion (inflation, hey!). You’re probably familiar with the first crop of new buildings: the F23 Administration building and Life, Earth and Environmental Sciences (LEES) building have both popped up on Eastern Avenue over the past year, and the FASS Building is taking shape on Parramatta Road. Oval 2 Grandstand was one of the first of the new buildings to be finished, and the Sydney Nanoscience Hub and Abercrombie Business School have both already cemented their place in campus life. Surprisingly, it seems the University predicted the current housing crisis. The University of Sydney’s Strategic Plan 2011-2015 mentions the provision of affordable housing as a key point initiative for the future of the University. There’s a massive number in the CIP that went unnoticed when it was first announced. Honi wrote in 2016 that the plan proposed to add 4,000 “affordable” beds to University-owned student housing. At the time, SRC Housing Officer Jenna Schroder told Honi that “rent will be 25 per cent less than market rate, that’s guaranteed.” That guarantee already exists at University-owned housing, and, unlike at STUCCO, there are no other conditions of entry: residents just need to be full time USyd students. The figure of 4,000 new beds is slightly exaggerated—it includes new developments by the residential colleges, including the construction of a completely new college called ‘Graduate House’ to be operated by St Paul’s. 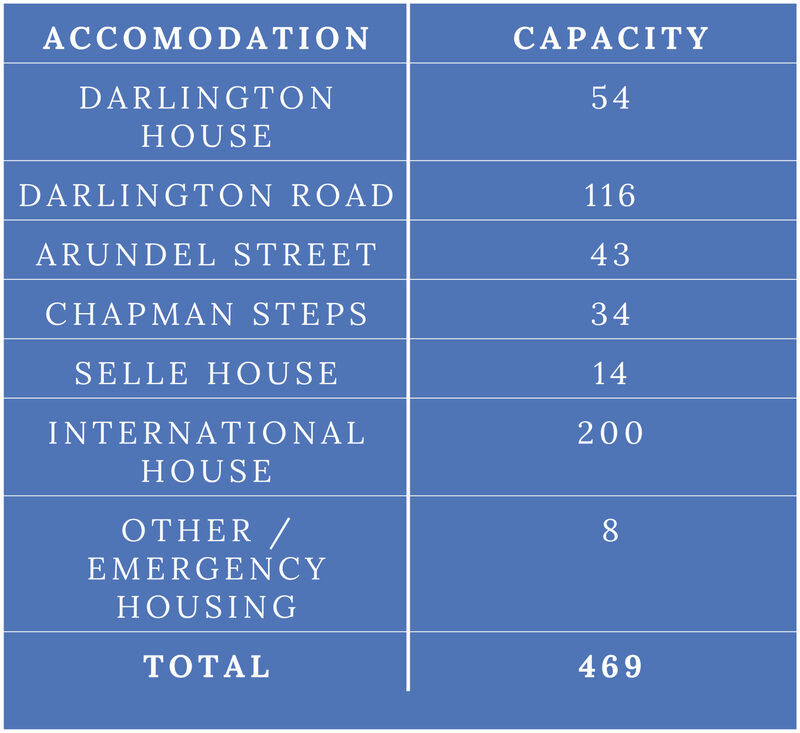 It is still an incredible increase: prior to the CIP, residential accommodation serving the University’s Camperdown/Darlington campus could only accommodate 469 students. In contrast, the residential colleges on campus could house 1,389 students. Subtracting the 1169 beds to be added by the residential colleges, USyd itself will, according to the CIP, be creating room for around 2,360 additional students. It’s more than a 500 per cent increase in University-owned accommodation—startling when you realise the CIP aims to increase the general student population only by 20 per cent. The plan is about halfway to completion: a thousand beds have been built, and around a thousand are yet to be built. The remainder will be supplied by proposed housing upgrades in the Regiment Building, the Darlington Terraces, International House, the Mackie and Telfer Buildings, Mallet Street, Maze Street Car Park, and Merewether. There will remain an unmet demand of approximately 6,745 beds by 2021 in the immediate vicinity of the University Campus. The Queen Mary Building (QMB) and Abercrombie Street Student Accommodation are both part of the CIP and are already open. QMB can take over 801 students, and Abercrombie 200, with the QMB winning 2016 Asia Pacific Student Accommodation Association Operation of the year. The University is preparing the Development Application and Environmental Impact Statement for the Darlington Terraces. The University owns 38 “Late Victorian Terraces” on Darlington Road, and plans “350 mixed single and twin dorm style bedrooms with shared kitchen and bathroom facilities”. Any rear structures which have been built onto the existing terraces will be demolished, and new three-storey blocks will be built across the backyards. The terraces will be used mainly for teaching or study spaces, while the new blocks will provide the bulk of accommodation. The University also suggested that “new retail, food and beverage outlets” could be included in the redevelopment. It’s planned that the new blocks will connect directly to the rear of the Abercrombie Business School. The existing residential colleges have planned extensive redevelopment as well: a new quadrangle being built at St Paul’s, and there will be extensions at both St Andrew’s and St John’s. Paul’s, as mentioned previously, is also constructing ‘Graduate House’, a college for postgrads that will be financially supported by the lease of subterranean space back to the University, creating a new precinct behind the Edward Ford Building. The current works at The Women’s College, while not residential, will add seven rooms to their total. The expansions are at different stages: Women’s is nearly complete but the new rooms at St Paul’s—promised for the start of this semester—are yet to officially open. The Regiment Building is taking shape, and a University spokesperson told Honi that it is on track to open in 2019. The new building sits opposite the Moore College development, and together, the two buildings are intended to form a high-rise ‘Western Gateway’ to the Camperdown-Darlington campus. The eight-storey Regiment Building will house 616 students, as well as rooftop gardens and a massive indoor bike lock-up. Pictured: The new Regiment Building will serve as a ‘Western Gateway’ to campus. 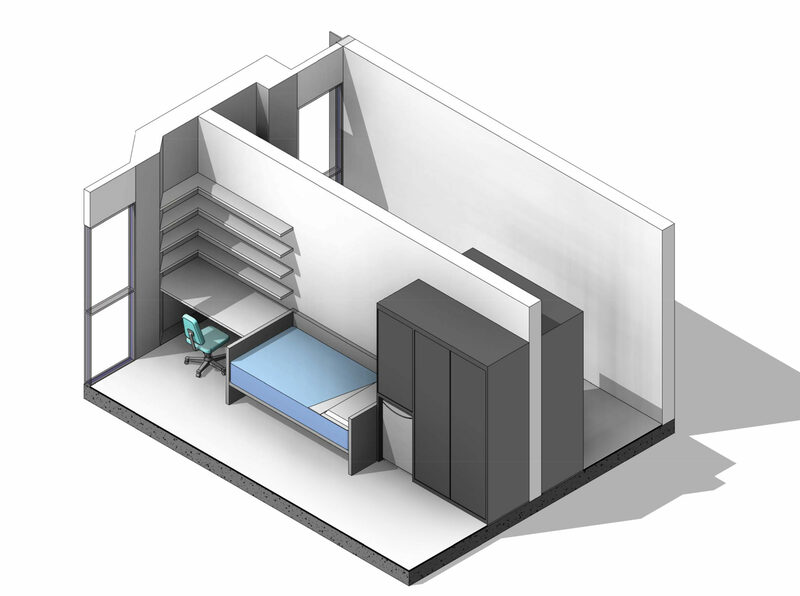 Most rooms in the Regiment Building will be quite small, with the floor size of 10.3 m2. The State Environmental Planning Policy (Affordable Rental Housing) 2009 (AHSEPP) mandates a minimum room size of 12 m2 for single rooms. But USyd negotiated with the NSW Department of Planning for a lower minimum size, claiming large common areas could offset cramped bedrooms; that “planning controls do not specifically cater to student housing”; and that the benefits of mass student housing far outweigh the cost of doing nothing. While the University wrangled over its planned micro bedrooms, the scope of its housing crisis finally became apparent. The University commissioned the Social and Economic Benefits report, to be provided to the Minister for Planning, as rationale for providing accommodation with less floor space than legally required. The report made the case that the need for accommodation was so urgent, that the University had no choice but to provide as much as possible in the real estate available. The report noted that despite the construction of the QMB and Abercrombie buildings “there will remain an unmet demand of approximately 6,745 beds by 2021 in the immediate vicinity of the University Campus.” Even after the development of the Regiment Building and the Darlington Terraces, there will remain a deficit of almost 6,000 beds by the completion of the CIP. Upon completion, the QMB and Abercrombie buildings were filled almost immediately. Currently, QMB has two vacancies out of 801 rooms, while Abercrombie has three vacancies out of 200. These are the only vacancies on the Camperdown/Darlington Campus (excluding emergency housing which is kept vacant, or International House, for which the University did not provide data). It says something about the sheer hunger for housing at USyd when when 1001 rooms get snapped up almost as soon as they hit the market. The University has set rent in its new developments at “below $300” per week, aiming to match local median prices and charge below the “affordable” market rate. It’s clear, though, that more needs to be done for the low income student who, according to Universities Australia, can only afford to pay $152.40/week or less. The University cannot rely on these ‘benefits’ on one hand to get its way with the Planning Department, and ignore them on the other to argue for fee deregulation. A University spokesperson told Honi that the University is currently formulating a strategy known as CIP2, which will remain in development throughout 2018. The current CIP (‘CIP1’) plans for the addition of 10,000 students from 2014-2020. If CIP2 is to add 10,000 more students by 2025, there are two things that need to be addressed: 1) How can the housing deficit be brought to zero, and 2) How can affordable housing be made available for those that need it most? The answer to 1) is simple: build more rooms. Mallet Street and the Maze Crescent Car Park are large precincts, but will they be enough for 6,000 more rooms? The University will need to consistently consider the question of student housing throughout potentially decades of further CIPs. The answer for 2) needs more thought. Last year, Vice-Chancellor Michael Spence pinned the annual Federal Budget as a main player in “cost-of-living challenges for students”. The solution, according to Spence, is fee deregulation, which would give the University enough funds to provide “financial support to underprivileged students”, including more adequate housing options and sponsored accommodation. “It’s frankly ridiculous for Michael Spence to suggest that deregulation of the university sector would act as some great ‘equaliser’, so that the extra money could be funnelled into student housing,” say SRC Education Officers, Lara Sonnenschein and Lily Campbell. The Vice-Chancellor’s controversial take would instead push low-income students away, according to Sonnenschein and Campbell, especially those from regional and rural areas. Fee deregulation to ‘free up money’ is not a solution to the problem of housing accessibility. The University’s own Social and Economic Benefits report notes the benefits of providing housing over simply throwing money at underprivileged students. The University cannot rely on these ‘benefits’ on one hand to get its way with the Planning Department, and ignore them on the other to argue for fee deregulation. Drawing directly from benefits listed in the report: If the University was to provide this financial support in the provision of housing, it not only makes a meaningful contribution to the crisis, but it also reduces competition for existing off-campus low-income housing for those non-students who need it most, such as city workers. Arguably most importantly—it reduces the risks of overcrowding in illegal accommodation. Developing lasting affordable accommodation today will benefit students in need for decades to come, while increasing fees and directing some of the revenue to housing will only fuel the need for more students and continue the vicious cycle of the housing deficit. The five-decade CIRP Freshman Survey, as well as analysis by Ernest T Pascarella and Patrick T Terenzini of over 5,000 studies of university students, are clear on the benefits of student housing: on-campus students were more likely to graduate than those living off-campus. So, good, affordable accommodation improves the learning environment for everyone involved. The University may have caught the crisis just in time, but it will need to seriously address the question of ‘affordability’ to keep the most vulnerable students from slipping under. A previous version of this article misnamed St Paul’s ‘Graduate House’.